Best of Both Worlds — Silver Wave Seafood Co.
Our passion lies somewhere between the Ocean, Mountains and Salmon. Follow along here for adventures, recipes & lessons from the Wild. DIRECTIONS: Pre-heat oven to 400 degrees. In a large roasting pan, mix fennel, lemon, garlic cloves ( unpeeled), 1 tablespoon of olive oil, 1/4 teaspoon of S&P. Roast until fennel softens ~ 8 mins. Season salmon portions with S&P and nestle in fennel, roast for 12-15mins. Meanwhile, squeeze roasted lemons, mash roasted garlic (after removing peel) into bowl, stir in honey and rosemary and remaining 2 tbsp. of olive oil and 1/4 teaspoon of salt. Drizzle dressing on top of salmon, cook for additional 2 mins. Serve salmon with fennel on bed of greens. Enjoy! DIRECTIONS: Pre-heat oven to 400 degrees. Crush 1/2 cup pistachios in a food processor until fine crumbs. Transfer to large bowl; add in the flour, salt, black pepper, lemon zest, cayenne pepper, paprika, and garlic powder. Mix well. In a medium-sized bowl whisk together the eggs and olive oil. Grind rest of pistachios into larger pieces (set aside). 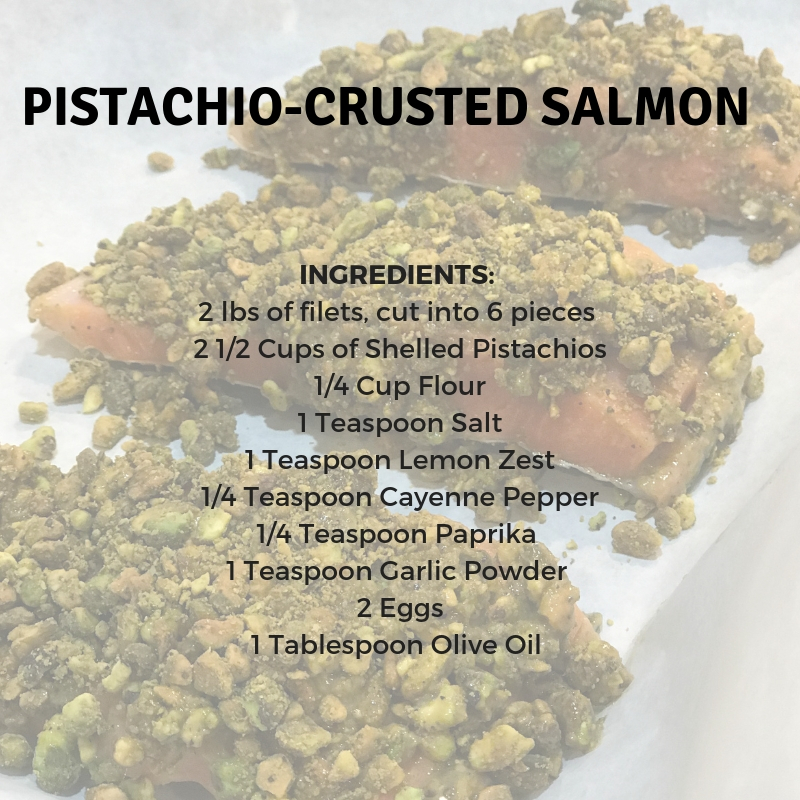 Coat salmon fillet in flour/pistachio mixture, dip in the egg/oil mix and then roll in larger pistachios. Place on parchment paper on baking sheet. Bake for 9 minutes, flip each filet and cook another 9 minutes until crisp on outside and cooked on inside. 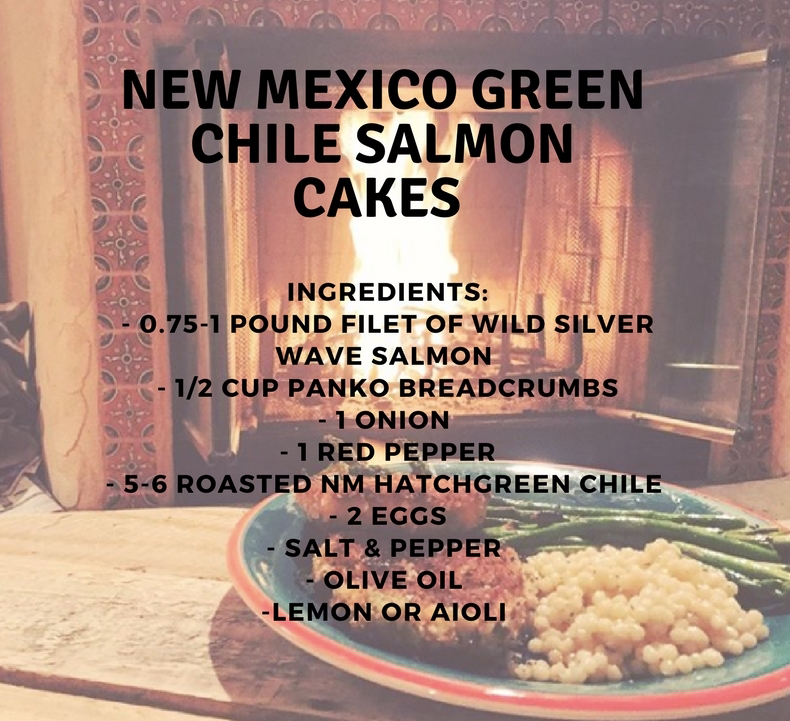 Here are a few of our recipes from our 2017 Wild Salmon Harvest! Chop onion, red pepper and 5-6 roasted hatch green chiles, prepare thawed salmon (either coho or sockeye!) by removing skin and pin bones, chop .75 - 1 lb. of salmon into small cubes, mix with chopped veggies ( onion, pepper, chiles), mix in 1/2 cup panko and two eggs, add salt and pepper. Mix. Cover mixture and put in refrigerator for 10-15 mins. Meanwhile, prepare skillet with olive oil and add high heat. Remove mixture from fridge, form handfuls of mixture into patties and cover/coat with panko. When ready, cook patties on skillet for 5-6 minutes on each side until crispy. Slightly cool and serve with squeezed lemon or aioli on top! Place aluminum foil on cookie sheet, sprinkle foil with 1 cup layer of salt (kosher or sea salt), then place salmon skin side down on top of the bed of salt, drizzle a light layer of olive oil, salt and pepper on top of filet(s) and place cookie sheet on grill for 10-15 mins. The salt doesn't make the salmon salty, but rather makes it moist & delicious! Pre heat oven to 385 degrees. Mix panko crumbs, nuts, cranberries,* parsley*, theme, lemon and orange zest together. * Leave some cranberries and parsley for garnish. Stir in 1/3 cup melted butter. Season salmon filet with salt and pepper, place on baking tray and sprinkle crust mix evenly. Drizzle over more melted butter. Cook in oven for 20-25 minutes until salmon is cooked through to medium and crust is golden. Garnish with remaining cranberries and parsely. Serve with lemon wedges. Enjoy! Silver Wave Wild Salmon is currently in transit from Alaska to Colorado and will be in our hands next week! "Everybody has there own preference and there are about a million ways to prepare salmon. Perfecting your favorite method might take a few trys, but we will be including some recipe ideas with your order and here are some tips from the Silver Wave crew on how they prepare salmon....."
For Sockeye: "I like to keep it simple because the meat has such a good flavor. I will put a filet on some foil on a cooking sheet, skin side down, and season with salt and pepper. I personally like to add little butter squares sprinkled over the filet, you could substitute drizzled oil. For added touch, sprinkle diced green onions on top. i then throw it in the oven for 20 minutes at 350. i do not like my salmon too dry so i make sure not to over cook it." For Coho: "I like to get creative. While the filets are delicious prepared like above, you can get a little more for creativity here. Most recently, a fellow Durangatang marinated a filet with some hatch green chile sauce, baked it and then drizzled it with agave nectar. All I can say is: Delicious!" Sign up today for Tierra Vida's Winter CSA to get veggies from end of October through December! hey are the perfect nutritional match for your Silver Wave wild salmon! It's FRIENDS WEEK at Silver Wave August 6-13! Because we LOVE our Friends. 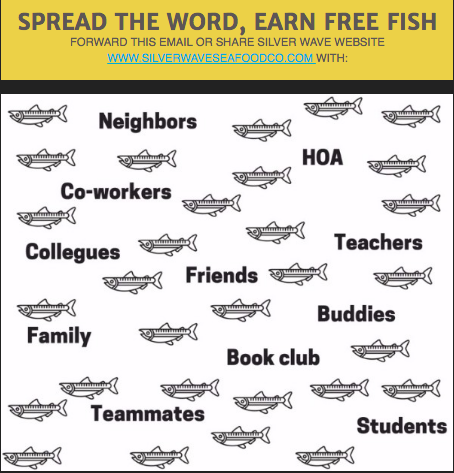 As a "Community-Supported" seafood business, the word "Community" means a lot to us. It means FRIENDS, support, stoke and collective power. As smaller, land-locked and rather remote mountain communities, Southwest Colorado knows what it takes to be a community...and we couldn't be more PROUD to be part of it! Thanks for having us, and most importantly, thanks for supporting us. 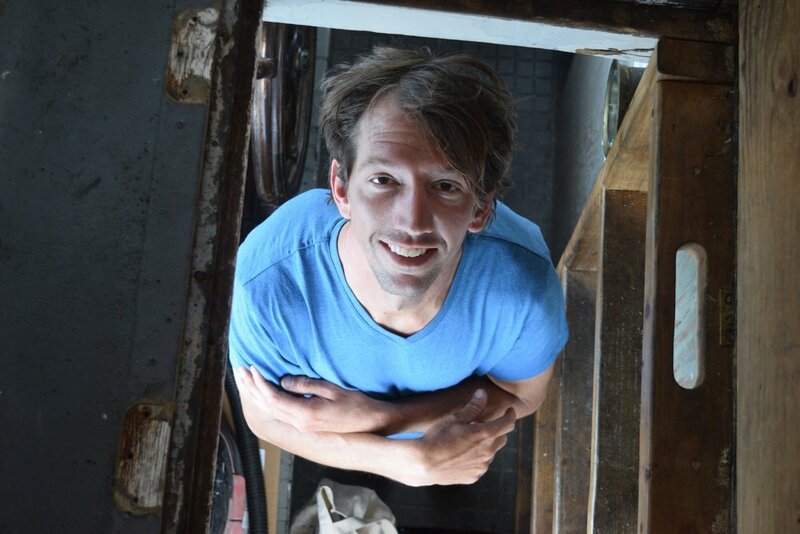 If it weren't for community, we wouldn't be able to transport our fresh catch of wild salmon from Southeast Alaska (which is also very remote and island-locked) to the people of Southwest Colorado. HOW IT WORKS: Spread the word to your local friends about Silver Wave and any orders placed between 8/6- 8/13 with your name in the "FRIENDS WEEK PROMO" box (see pic below) will earn you AND your friend (the one placing the order) an additional 1 lb. of fresh frozen, wild-caught Alaskan Coho to BOTH your orders! ONLY RULE: Both Friends must place orders of fresh frozen salmon shares either the 10lb., 15lb., 25lb. or 50lb. share to qualify. 1.) The order summary when checking out will not automactically add one pound to your total, Silver Wave will be keeping track and confirm the added total individually after the promotion is over via e-mail. 2.) If a friend has already referenced you in an order prior to 8/6 we have already added something special to your order as a sign of our appreciation. Thank you! Do you want to know something crazy? 90% of the fish we eat in America is imported. Way too much of that fish is farmed (see blog post below about farmed vs. wild). But, a lot of it is wild-caught in America….yet still imported. Yeah, like we said, crazy. A large amount of fish wild-caught in Alaska is frozen and exported to places like China where it is defrosted, deboned, processed and then refrozen. Then, this American-caught fish is exported back to the U.S. to be purchased back by Americans. That creates a large carbon footprint, requiring excessive transportation overseas and back + trucking to your local store. Not to mention how much time that takes to get fish from the fishing boat to your table. It has literally taken a trip around the world before it gets to your home. At Silver Wave, we welcome you to KNOW YOUR FISHERMAN. Eric, co-founder of Silver Wave is out there catching YOUR fish. Which is frozen ONCE and processed IN Southeast Alaska. It is then put on a barge from Alaska to Seattle, a truck to SLC and then MJ & Eric will pick up the fish for a Southwest Colorado delivery for you to pick up and bring home. Order some of our AMERICAN, Wild-caught-in-Alaska-only-frozen-once-never-exported-fish today: HERE. Interested in learning more about Wild Salmon? We think you'll find them fascinating. DAMS: Another hot topic regarding the migration and vitality of our wild salmon, we highly recommend watching "Dam Nation"